Be the first to share your favorite memory, photo or story of Anne . This memorial page is dedicated for family, friends and future generations to celebrate the life of their loved one. 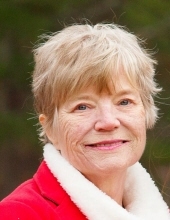 Anne "Betsy" Smotherman Haskell, age 71, passed away March 20, 2019. She was born in Chattanooga, TN, and grew up in Red Bank, TN. She attended Chattanooga High School and excelled in drama, dance, and marching band. She graduated from Virginia Intermont College in Bristol, Virginia, and The University of Tennessee, where she completed an Ed.S. in Elementary Education. She taught at Soddy-Daisy Elementary, and then Red Bank Elementary. She met her husband, Dr. Sam Haskell, retired Psychologist and former Douglas County School Board member, while pursuing a Master's of Library Science. They married in 1980 and lovingly raised two children, Elizabeth and Lucy. Betsy treasured every day. She found great joy in her lifelong passion for drawing, painting, dancing, and acting (Cultural Arts Center, 1991). She shared her love of Scripture with her friends as a faithful member of Saint Julian's Episcopal Church. She was an avid supporter of Douglas County Special Olympics and cherished friendships made while volunteering with her family. Betsy was preceded in death by her parents, Herbert and Elizabeth. She is survived by her husband, Sam, her children, Elizabeth and Lucy, her brother Mac Smotherman, cousins, in-laws, and her dog, Asher. A celebration of Betsy's life will be held at St. Julian's Episcopal Church, 5400 Stewart Mill Road, Douglasville, GA, on March 30, 2019, at 2 p.m. In lieu of flowers, her family requests memorial contributions be made to Douglas County Special Olympics or St. Julian's Episcopal Church. To send flowers or a remembrance gift to the family of Anne Smotherman Haskell, please visit our Tribute Store. "Email Address" would like to share the life celebration of Anne Smotherman Haskell. Click on the "link" to go to share a favorite memory or leave a condolence message for the family.